bonus is that shipping is only £1.50 for UK shipments so you can shop till you drop without spending double the amount on shipping! And not to mention, the way they wrap their products and ship them. They make such an effort to make sure everything is beautifully packaged and with you within 5 days. So far I have ordered from the site twice THIS WEEK as I only got a couple of items using a code to get 10% including sale items but a few days later they gave out a coupon that gives you 30% off store wide! How could I not resist? Of course...I couldn't and I ended up spending a bit much. Both orders came today as I write this (Saturday 27th) as the guys at Boho Moon were very kind to send my second order by 1st class so it would get here on the same day (Thank you!!). Due to the amount I have received though, I will be splitting this haul into two separate posts so they aren't too lengthy. First up are these two 12" chokers, one with a Pentegal / Pentagram charm and another with a cut-out moon. These are only £5 and you can choose what chain you would like from either a 12" black choker, 18" black necklace or a 18" sterling silver chain. There is also a choice 8 different charms you can choose from. 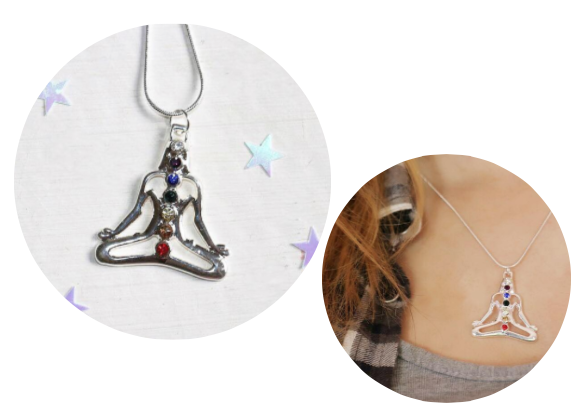 They are great for layering with other necklaces like shown above. Also shown above are two Night Wire Wrap Quartz Necklace which are available in 8 different quartz. I got Green Aventurine and Opal. Like most green crystals, the Green Aventurine is a Heart Chakra Stone and will help when it comes to relationships. This quartz helps in releasing anxiety and relieving stress. 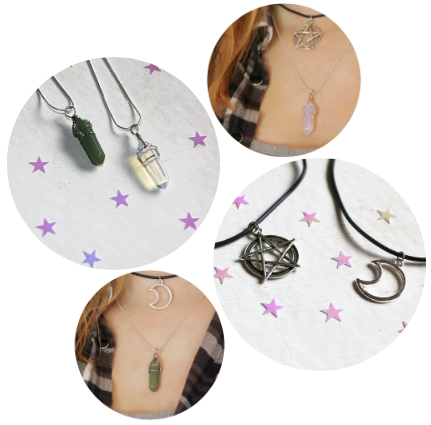 These crystals are also known to also be stones that aid your prosperity and are know as the stone of luck and will help you manifest money if that is what you want. The Opal Quartz is regarded as a stone that is strongly associated with emotions. It is also believed to promote spontaneity, imagination, dreams and healing. This Quartz draws off negative energy of all kinds, neutralising background radiation and it balances and revitalises the physical, mental, emotional and spiritual planes. It also cleanses and enhances the organs and brings the body into balance whilst it also aids concentration and unlocks memory. On top of that (if the above meant anything to you) I think they are both very pretty and worth the sale price of £5 down from £12. I fell in love with this necklace the minute I saw it through a mid-scrolling process on the website. This is a Wire Wrap Titanium Quartz. Titanium molecules are bonded to the quartz by the natural elector-static charge of the crystal. Titanium is one of the strongest and most beautiful of all metals and as you can see the colours of this stone are just beautiful. Even though this crystal shares the same properties as the Clear Quartz, it is the colours if this crystal that apparently grant it enhanced healing powers. The crystal has the ability to heal the human energy field and "it is stimulating to the auric field and meridians, acting as a prism for soul-level energy, infusing the aura with a rainbow spectrum of light". Basically, this crystal is one that brings insight, compassion, energy, excitement and joy into life's experiences. The necklace is usually £16 but is now £7 in the sale. Without going into as much detail as I previously have, this Chakra Healing Necklace has 7 circular vortexes of energy starting from your tail bone and ending at the crown of your head. It is used to help balance your aura and ensure a steady flow throughout. 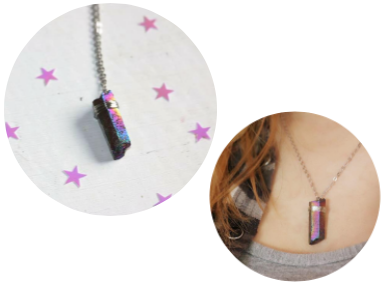 This necklace is usually £12 but is now only £6 in the sale. 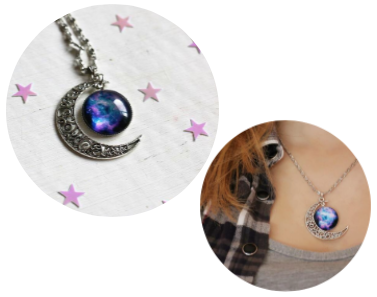 Last up for this post is the gorgeous piece, the Satellite Crescent Necklace. I found this necklace completely mesmerising. It is available in 5 different coloured charms and the one I bought was a blue and purple mix. It was a tough decision between this one and the full blue one as they are all completely stunning! At just £4 instead of £10 I think I will be buying them all!